Using the gentle and rib-tickling humour, this Veggie Tales book dives into the biggest Bible stories that show how to follow God. Join Bob the Tomato, Larry the Cucumber, and the whole VeggieTales gang as they share twenty favorite Bible stories. 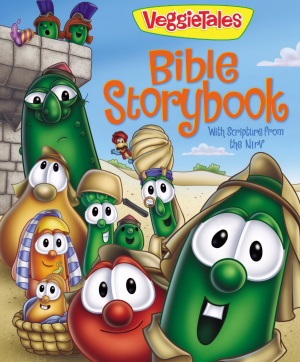 Based on the popular videos, this Bible storybook combines VeggieTales fun with over twenty favorite Bible stories. Kids will learn classic Bible stories and gain an overview of the Bible. And they'll be laughing and having fun while they're at it - a perfect way to introduce children to the Bible. Loaded with humor, colorful art, and fun features. Humorous call-outs throughout Have fun while learning Bible stories and the important message each one brings. Sunday morning values, Saturday morning fun! Veggie Tales Bible Storybook by Cindy Kenney was published by Zondervan in September 2006 and is our 13227th best seller. The ISBN for Veggie Tales Bible Storybook is 9780310710080. Great fun stories. Backed up with Bible stories. Helps the kids to have fun while learning the way of light. Got a question? No problem! Just click here to ask us about Veggie Tales Bible Storybook.